FISH (The Forum on Information Standards in Heritage) is pleased to announce the re-launch of its website at a new url: <http://www.fish-forum.info>. details of the work of the forum in developing standards to support data capture and data sharing between projects and systems that record a wide range of aspects of the historic environment. links to the FISH discussion list where you can review previous discussion and download files, or join 300+ members in discussing and taking forward the work of the forum. details of the contributing organisations that currently send representatives to the face-to-face meetings that direct the work of the forum. information on emerging standards for data content (MIDAS) and indexing terminology (INSCRIPTION). FISH is the leading forum for standards development in heritage in the UK and Ireland. It is of wide relevance to the HE and FE communities, particularly in fields like archaeology, museum studies, architecture, the visual arts, estate management, historical geography and the like. It is also of relevance to anyone with an interest in interoperability and data standards. Specialists with an interest in educational metadata, collections management, geo-spatial metadata, collections and archive description and art historical metadata are particularly welcome to participate in the forum and to draw from the resources it makes available. This will help the construction of shared and consistent cross-sector standards. Librarians, archivists and all manner of information managers are welcome to participate and contribute to the discussions. FISH focuses its work mainly on the built and buried historic environment, but is keen to make cross-reference to standards in related sectors where appropriate. It was established in August 2001, taking on the work of an earlier discussion forum (FISHEN) which focussed on the development of standards for heritage information in England. Contributing organisation to FISH are drawn from across the United Kingdom and Ireland, including all of the UK's major heritage management organisations, such as English Heritage, Historic Scotland, the national monuments records for Scotland, England and Wales, CADW, the Northern Ireland Office and the association of Local Government Archaeologists. Higher and further education is represented by the Archaeology Data Service and other services from the Distributed National Electronic Resource (DNER), and the museum sector is represented by the mda. The forum works to co-ordinate, develop, maintain and promote standards for the recording of heritage information. The current Convenor of the forum is Nigel Pratt of the Association for Local Government Archaeological Officers (ALGAO). The Forum Co-ordinator is Edmund Lee of the English Heritage Data Services Unit. The new web site is hosted by mda and is online at <http://www.fish-forum.info>. The Tibetan and Himalayan Digital Library (http://www.thdl.org) is building an international archive of knowledge about Tibet and the Himalayas in conjunction with a broad range of institutions, scholars, librarians and others. It provides an integrated environment for digital publication of diverse projects from multiple disciplines, with their separate administrations remaining decentralized and autonomous. Its conception of a digital library is based upon the notion of an information community, which stresses the creative nexus of knowledge and community in its integration of people, collections, and tools. THDL is collaborating with the University of Virginia Library to develop a supporting infrastructure for articulating and sustaining the multiple communities involved in producing, archiving and utilizing knowledge about this area of the world. This will include (December 2002) rosters of information about individuals and organizations, an annotated guide to Web resources, chat rooms and e-conference facilities. We are concerned to make all resources in the digital library multilingual, so that residents of the communities being studied can both generate and view resources in their own scripts (Tibetan, Nepali and so forth). Evidence of our current efforts to develop resources that facilitate multilingualism can be viewed in the Tools section of the website (http://iris.lib.virginia.edu/tibet/tools/index.html). Tools are also central in building Web-based interfaces allowing participants around the world to work with resources, thus taking advantage of the Web's power for a two-way process of generating and accessing information, as well as providing tools for other users to build new user-defined collections from extant collections. The actual site is organized into five overarching domains: Collections, Reference, Community, Education and Tools. The Collections domain provides deep level catalog access to all holdings as independent objects. The various thematic collections presents those objects from disciplinary perspectives, whereas the Environmental and Cultural Geography collection presents the same objects in an integrated fashion based on time and space. There are multiple catalogs including a complex video catalog and workflow management system (http://nmc2.itc.virginia.edu/tibet/ndrp/mediaflowcat/ titles_search.cfm?mode=content>). We are currently migrating objects in the video catalog into XML, adhering to a collection-building DTD developed at UVA called GDMS (General Descriptive Modeling Scheme). The video catalog has a web interface which presents video in tandem with multi-lingual transcripts (see examples in Lhasa Soap Opera Collection). We are also developing with UCLA and UVA a new suite of Java-XML software called Savant (http://iris.lib.virginia.edu/tibet/tools/savant/) for allowing analytical searches of these multi-lingual transcripts, and time synchronized playback of media and transcript. Currently supporting Roman and Tibetan scripts, we plan to add support for Devanagari, Chinese and Japanese in the coming year. For literature collections, we have developed a powerful SGML/XML system for utilizing a deep cataloging system to provide integrated access to catalogs, manuscript scans, typed in texts, translations and scholarly summaries for Tibetan literature (http://iris.lib.virginia.edu/tibet/collections/literature/ngb/ngb-home.html). For the Cultural and Environmental Geography, we have been developing a GIS base model of the area with broad scale regional coverage of administrative areas, the land use and census data (http://lewis.lib.virginia.edu:8080/arcims/Tibet_geostyle/viewer.htm), interactive maps (choose "mapping" from http://iris.lib.virginia.edu/tibet/collections/cultgeo/index.html), rich visualizations such as of a three dimensional interactive monastery (choose "projects: Meru Nyingba Monastery" from same URL) and a XML Gazetteer to serve as the place index of all cataloging within the library (http://iris.lib.virginia.edu/tibet/reference/gazetteer.html). We are also developing a Digital Ethnography System based on our extensive fieldwork experience in Tibet to provide tools that facilitate direct integration of resources created in the field into the Digital Library. One caveat is that we are now in the process of a complete transformation in the navigation system, such that some aspects of the site currently have problems under Netscape. The technical basis for the digital library is called FEDORA: "Flexible Extensible Digital Object Repository Architecture" (http://www.dlib.org/dlib/july00/staples/07staples.html). It is currently being developed by the University of Virginia and Cornell University with Mellon funding. Specific technical adaptations and supplements to suit THDL are being performed by staff mostly located at the University of Virginia in THDL, the Digital Library Research and Development Department, the Institute for Advanced Technology in the Humanities, Digital Media Lab and Geospatial and Statistical Data Center. Participants overall include Cornell University, Rice University, University of Chicago, CNRS-Paris, Cambridge University, Griffiths University, University of California at Santa Barbara/Los Angeles, Naropa University, University of North Carolina at Charlotte, Tibet University, the Tibetan Academy of Social Sciences, and other institutions. Major funders include the United States Information Agency, National Endowment for the Humanities, and Department of Education. In early May, the Association of Research Libraries (ARL) announced the launch of the Scholars Portal Project by seven ARL member libraries in collaboration with ARL and Fretwell Downing, Inc. (FD). The Scholars Portal Project evolved out of the ARL Scholars Portal Working Group's interest in identifying how best to establish a collaborative research library presence on the Web (see http://www.arl.org/access/scholarsportal/index.html). The Working Group articulated the need for a suite of web-based services to connect the higher education community, initially undergraduates, as directly as possible with high quality information resources. In its discussions over the past 18 months, the Working Group realized that central to the Scholars Portal service is a discovery tool that enables a user to initiate a single search across a range of diverse and distributed websites, library catalogs, licensed electronic resources, public domain materials, etc. The Working Group undertook an environmental scan of existing products that included a discovery tool as well as other features, such as the ability to integrate, manipulate, and distribute data and share that data in consultation with colleagues. From the results of the environmental scan, the Working Group selected FD because it concluded that FD's products best fulfilled the Scholars Portal vision and that FD was ready and able to collaborate with the Working Group on advancing priority enhancements. The Working Group's choice of FD does not represent an ARL bias against any other portal products or an endorsement of FD's products. In fact, the ARL Scholars Portal Working Group encourages other vendors to enhance existing products or develop new products that serve the needs of the research library communities. The three-year project begins with seven libraries and will expand to any ARL member library interested in participating. FD is contributing development resources for enhancements to their products identified by the Project participants. The Scholars Portal Project is one of several activities being monitored by ARL. ARL staff continue to monitor portal software applications. ARL will host a meeting prior to ALA where librarians and/or vendors may come together to hear reports by librarians in ARL member institutions on their portal implementations. ARL also plans to issue a call for vendors of portal products to establish an Implementers Group. ARL's involvement in the Scholars Portal Project and related activities are all aimed to encourage multiple vendors to develop portal software tools that will serve well the constituencies of academic and research communities. Works of variable media art, such as performance, installation, conceptual, and digital art, represent some of the most compelling and significant artistic creation of our time. These works are key to understanding contemporary art practice and scholarship, but because of their ephemeral, technical, multimedia, or otherwise variable natures, they also present significant obstacles to accurate documentation, access, and preservation. The works were in many cases created to challenge traditional methods of art description and preservation, but now, lacking such description, they often comprise the more obscure aspects of institutional collections, virtually inaccessible to present day researchers. Without strategies for cataloging and preservation, many of these vital works will eventually be lost to art history. Description of and access to art collections promote new scholarship and artistic production. By developing ways to catalog and preserve these collections, we will both provide current and future generations the opportunity to learn from and be inspired by the works and ensure the perpetuation and accuracy of art historical records. It is to achieve these goals that we are initiating the consortium project, Archiving the Avant Garde: Documenting and Preserving Variable Media Art <http://www.bampfa.berkeley.edu/ciao/avant_garde.html>. The collaboration includes of the Berkeley Art Museum and Pacific Film Archive (BAM/PFA) <http://www.bampfa.berkeley.edu>, the Solomon R. Guggenheim Museum <http://www.guggenheim.org>, the Walker Art Center <http://www.walkerart.org/jsindex.html>, Rhizome.org <http://rhizome.org/fresh>, the Franklin Furnace Archive <http://www.franklinfurnace.org>, and the Cleveland Performance Art Festival and Archive. For more information, please see the project description at <http://www.bampfa.berkeley.edu/ciao/avant_garde.html>. Singapore successfully hosted the world's first World Library Summit (WLS)  an international event that brought together over 1,000 professionals in the information and knowledge related fields to meet and exchange ideas. Themed 'Global Knowledge Renaissance', the event saw leaders of the industry, academia, government and business from 19 countries coming to Suntec Singapore to hear 60 speakers expound on knowledge governance and people connectivity as key foundations for new knowledge societies as well as the convergence of the traditional strengths of libraries and archives with modern-day implementations of knowledge tools and applications in the IT arena. View of the National Library Board exhibit at the World Library Summit. 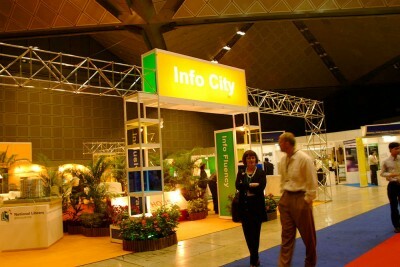 This anchor pavilion is named "Info City" as a precursor of what is to come in the new intelligent National Library at Singapore. Photograph courtesy of the National Library Board, Singapore. Used with permission. Organised by the National Library Board of Singapore (NLB), <http://www.nlb.gov.sg>, and the Ministry of Information, Communications and the Arts (MITA), WLS was supported by the Infocomm Development Authority of Singapore (IDA) and the National Heritage Board of Singapore (NHB), together with 20 other public and private institutions. "The World Library Summit promotes international exchange of experiences and ideas in the library and information world," said Dr Tan Chin Nam, Chairman, NLB. The guest-of-honour at the opening of the World Library Summit in Singapore, was Mr. David T. M. Lim, the Acting Minister for Information, Communications and the Arts. In the opening speech marking the start of the summit, Mr. Lim said that the conference underscores the importance of knowledge in the global economy. "The presence of so many experts and leaders of the library and archive services affirms the timeliness of the conference and the interest in exploring the theme," he added. One of the major highlights of the seminar was the first keynote address by Dr Douglas Carl Engelbart, the director of Bootstrap Institute and Bootstrap Alliance. Dr Engelbart is better known as the American inventor who pioneered many of the basic concepts of computers that we take for granted today, including the mouse, interactive computing, hypermedia, multiple windows, teleconferencing, and the graphical user interface. Touching on knowledge augmentation for the 21st Century, he outlined how the rate of technology innovation "has augmented basic human abilities, opened possibilities but which has also threatened to tear our social fabric." Dr. Engelbart then examined the new developments that strain the ability of governments, libraries and other social institutions to bridge the digital divide and proposed a role for world library organisations as leaders in knowledge augmentation for the 21st century. A second highlight of the WLS was the speech by Dr Charles F. Goldfarb, commonly called the 'father of markup languages'. Dr. Goldfarb invented the SGML language in 1974 and later led the team that developed it into the international standard on which both HTML and XML are based, thus paving the way for the creation of the Internet. Dr. Goldfarb expounded on the relationship between markup languages and knowledge retention. "We computerise the capture of documents in rendered form, using a word processor that promises that what you see on the computer screen is exactly what you'll get on the printed page and we can automate card catalogues, but still can do little to interconnect the objects they describe. Even the World Wide Web's hyperlinking is of limited utility because it, too, is based on rendered objects - web pages - rather than on the ideas they contain," he said in his speech. Ms Lynne Brindley, chief executive of The British Library commented that it was appropriate to have the summit in Singapore. "Singapore is admired from afar as a knowledge society, where the library plays a critical role," she said during her presentation touching on key challenges that will position the library of the 21st century. Delegates from around the world took advantage of the three-day conference to network and learn from the wide variety of speakers. Dr. Babu Rao Gonipati, Assistant Librarian with India's Andhra University Library was all praises for NLB for holding the summit. "My library has 450,000 books and has been opened since 1926, but is a very much a traditional one and we hardly have any modern gadgets. I learnt a lot about the modernisation of library - the utilisation of emails, websites and databases," he said. Dr. Gonipati plans to make full use of the connections and ideas that he picked up during his stay. " When I get back I will draw up plans to implement latest developments, and recommend the various IT solutions to bring my library into the digital age," he elaborated. African Journals OnLine (AJOL) assists all those who need access to research and information on Africa. Its long term aim is to provide a comprehensive coverage of all scholarly journals currently published in Africa. It offers free access to the Tables of Contents and abstracts of over 70 journals in all disciplines, together with links to full text where available and a document delivery service. Over 2,500 people have registered to use the service and the AJOL pages receive over 44,000 hits each month. If you have not yet used the service, why not register now? If you are already a user, why not look at the new features and wide range of new titles? Go to: <http://www.inasp.info/ajol/>. "London, 10 May 2002  Resource: The Council for Museums, Archives and Libraries has received one application from each of the nine English regions for selection as regional museum hubs. The recommendation for a new, integrated framework for regional museums, based on a network of regional museum hubs, comes from the report of the Regional Museums Task Force, Renaissance in the Regions: a new vision for England's museums. The regional museum hubs will be leaders in museum practice and champions of regional museum communities." "...The nine hub applications will be assessed by an independent expert panel. Their views will inform Resource and the Department for Culture, Media and Sport who are responsible for selecting the new regional museum hubs." For more information, please see <http://www.resource.gov.uk/news/> and select the press release for 10 May 2002. "Public Record Office Victoria, the Archives of the Australian state of Victoria, welcomed today's $8.2 million budget announcement by the Victorian Government which will future-proof the State's electronic information." "The money will be spent on the innovative and world-leading program, VERS (Victorian Electronic Records Strategy)  addressing the preservation of vital data forever, in spite of quickly changing software, formats and computing technology." "Public Record Office Victoria (PROV), has been developing the strategy as an effective and practical solution to the recognised problem of sustaining electronic records into the future." "Director of PROV Ross Gibbs said that this important project has the potential to impact on every aspect of preserving our history, both in the government and private sectors." "'It provides an innovative solution to the problem that the whole world is currently trying to resolve,' Mr. Gibbs said." "DUBLIN, Ohio, May 2, 2002�The Bill & Melinda Gates Foundation today awarded OCLC Online Computer Library Center a three-year, $9 million grant to build a Web-based, public access computing portal for public libraries and other organizations that provide open access to information. The new portal will build on the foundation's five-year-old U.S. Library Program, which is providing computers with Internet access to more than 10,000 libraries across the United States." "...To help bring widespread public access to information technologies, the portal will be designed to serve the ongoing needs of public libraries in managing hardware and software, implementing advanced applications, training staff and patrons, and delivering digital library services. It will leverage the installed computing base and trained population already established by the foundation's US Library Program to develop a community of librarians who can share the resources and information necessary to provide ongoing public access computing. Content will serve five critical areas: continuing education, technical support, purchasing, capacity building and community building. The portal will host a range of services and tools, such as online tutorials, training modules, Web casting, message boards and expert assistance that will help libraries manage and enhance their programs." For more information, please see the full news release at <http://www.oclc.org/oclc/press/20020502.shtm>. "Mountain View, Calif., USA, April 26, 2002--Full support for OpenURL dynamic link creation is now in the newest version of Eureka(R), the Web search interface to many of RLG's databases. Libraries and information centers with their own OpenURL resolvers can turn RLG's millions of records for articles, books, and materials of all kinds into immediate links to the array of resources and services they can offer their users." "An institution's resources may include online full-text article collections from a variety of suppliers, its online catalog to local holdings or a larger regional resource, connection to an interlibrary loan request mechanism or to online booksellers, and more. With OpenURL set up, RLG databases become powerful finding tools for institutional offerings, presenting users with an integrated set of information choices a mouse click beyond their Eureka search results." "OpenURL defines a syntax to package metadata and identifiers that describe information objects and to point to a specific institution's link-resolution server or resolver. The resolver can accept this packaged data, combine it with institutional information, and turn the data into actual links. OpenURL is context-sensitive, enabling links to be based on what is available at each individual institution using it. Having started as a single-vendor proprietary service, it became a multiple-vendor NISO draft standard early this year." For more information, please see the full RLG press release at <http://www.rlg.org/pr/pr2002-openurl.html>. The following announcement was distributed to several listservs on 26 April 2002. "Recently, NISO, the National Information Standards Organization and DLF, the Digital Library Federation announced the undertaking of a two month study to evaluate the current use and potential of standards to facilitate the exchange of serials subscription information for both print and electronic resources. NISO would like to know more about how libraries gather, use and share subscription information." "A questionnaire for libraries has been placed on the NISO web site. Because NISO supports the development of standards for the information community based on consensus among constituents, we are grateful for the interest of libraries who benefit so much from these standards." "Please take some time to visit the NISO web site and fill out the survey which can be found at <http://www.niso.org/survey/serials.cfm>. The survey will close on May 30. A final report on this study, including recommendations, will be on the NISO website in late June." "London, 22 April 2002 - Today Resource: The Council for Museums, Archives and Libraries launched its first cross-domain publication, Benchmarks in Collection Care for Museums, Archives and Libraries, at the annual meeting of the Care of Collection Forum at Tate Britain." "Peter Winsor, Collections Development Manager at Resource, commented: 'Benchmarks in Collection Care is the UK's first cross-domain standard describing how we should care for our portable cultural heritage and, as such, is a landmark document. Its publication clearly demonstrates the common agenda shared by all those working in the museum, archive and library domains.'" "Benchmarks in Collection Care is a wide range of benchmarks to assist in assessing preservation needs and measuring levels of collection care. Resource recognises that stewardship is central to development and use of collections, and is the foundation for its ambition to ensure sustainable access to the cultural heritage." "Benchmarks in Collection Care for Museums, Archives and Libraries is available free of charge from Resource publications. To order a copy please email Viola Lewis, Communications Assistant, at <viola.lewis@resource.gov.uk> or telephone 020 7273 1458." "Once again at Museums and the Web 2002, a panel of museum professionals recognized excellence in heritage web site design with the Best of the Web Awards." "A panel of judges reviewed sites from around the world that were nominated by the community. (See <http://www.archimuse.com/mw2002/best> for lists of the judges and of the sites nominated.)" "WASHINGTON, D.C.�The Council on Library and Information Resources will join with Dartmouth College Library to develop a Scholarly Communication Institute with a new grant from The Andrew W. Mellon Foundation." "Digital technology is changing the traditional process of scholarly communication�the process by which scholarly information is created, distributed, stored, and preserved. Scholars, libraries, and commercial and nonprofit organizations have undertaken numerous experiments to explore the potential of digital technology for creating richer materials or better access for teaching and research, or for helping libraries alleviate space or resource constraints. We know little about whether many of these experiments can become sustainable, and we know less about how systemic change will occur over time." "The Scholarly Communication Institute will bring together pioneers and innovators in scholarly communication for a one-week residential experience that will allow them to discuss, plan, and organize institutional and discipline-based strategies for advancing innovation in scholarly communication. The institute will foster this cadre of leaders as mentors to the next generation of individuals who will work at the forefront of the transformation of scholarly communication in a digital environment." For more information, please see the full press release at <http://www.clir.org/pubs/press/2002_mellsci.html>. "WASHINGTON, D.C.�The first recipients of Mellon Dissertation Fellowships for Research in Original Sources in the Humanities were announced today by Deanna B. Marcum, president of the Council on Library and Information Resources (CLIR). Eleven fellows have been selected from among 128 eligible applicants in 53 graduate schools across the United States." "'We are grateful,' Ms. Marcum said, 'to all who applied and to the committee of distinguished scholars, librarians, and archivists who labored diligently and conscientiously to evaluate the applications. So many were worthy that the selection was extremely difficult.'" "A grant from The Andrew W. Mellon Foundation is enabling CLIR to award about 10 dissertation fellowships in each of three years beginning in 2002. Each fellowship provides up to $20,000 to support dissertation research for a maximum of 12 months...."
For more information, please see the full press release at <http://www.clir.org/pubs/press/2002_mellfell.html>.